Sophocles' tragedy is believed to have been performed between 410 and 411BC. Briefly, its eponymous heroine (sic) Elektra mourns her murdered father Agamemnon. She tries to persuade her sister Chrysothemis to help her wreak revenge upon the perpetrators, which include her mother Klytemnestra. She in turn, is plagued by nightmares and fears, but derives some satisfaction in news of the death of Elektra's absent brother Orest. On her own, Elektra begins to dig up the axe that had slain Agamemnon, but is then interrupted by a stranger in the courtyard. To her delight, it is her brother Orest; not dead as was feared, but has now returned in secret. 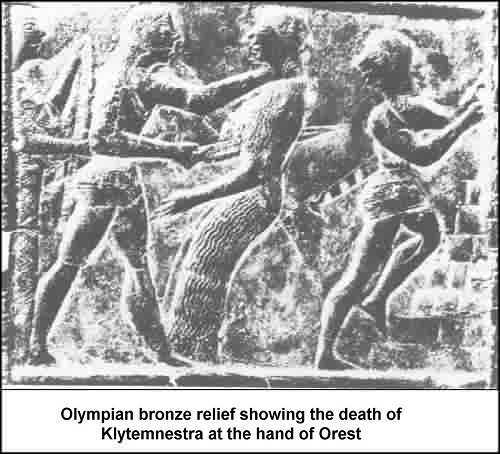 After some persuasion by his sister, he enters the palace and kills Klytemnestra. When Klytemnestra's lover Aegisth appears, Elektra leads him into the palace and to his own murder. She dances in triumph, and collapses dead. This one act opera by Richard Strauss has as its librettist Hugo von Hofmanstal, after his own play based on the Sophocles drama and was first performed in 1909 in Dresden. This recording comes from those operatically fruitful years whilst John Culshaw was with Decca, a period that which began in 1956 and came to an end in 1967, and included the entire Ring cycle by Wagner. Elektra could well have been his last production with the company. It was Culshaw's realisation that the advent of stereo offered a unique opportunity to attempt to create aurally what the listener missed from not actually being at a stage performance. To this day there are many, this reviewer included, that regard his productions for Decca as definitive performances on record. 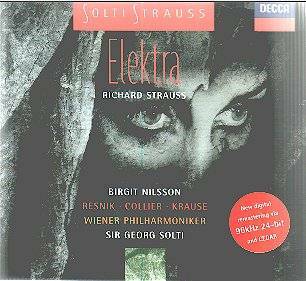 Elektra is no exception, with the principal role sung by Birgit Nilsson at the height of her powers. There are no longeurs in Elektra, it is riveting drama from start to finish. Newcomers to this recording should begin with Elektra's great aria near the beginning, when she sings of her loneliness and her passionate desire for revenge (CD1, band 2). This 9-minute aria is a tour de force and at the very moment she sings of the love for her dead father, Strauss' music suddenly takes on an almost unbearable lyricism. One is reminded of Salome's final aria when she sings to the head of Jochannaan in his other one-act opera, "Salome". Another sequence illustrating Culshaw's technique of creating a vivid aural image is during the scene when Klytemnestra is hacked to death in a rear room of the palace (CD2 band 10). Solti's conducting of the Vienna Philharmonic creates enormous tension as the moment approaches about 8 minutes from the end, when Elektra waits to hear of the death of her mother at the hand of Orest. Then, from somewhere in the rear of the sound stage, comes a bloodcurdling scream. Elektra declaims "Strike again!" and this is followed by a dull moan that is undeniably terminal. Only a superb understanding of what can be achieved by stereo techniques, can the oppressive atmosphere of this remarkable drama be conveyed to the listener. This re-issue, which takes advantage of the variety of modern methods for removing such artefacts as hiss, emphasise if one were needed, that this is the version all Strauss lovers should have. It certainly belies its 32 years.